This article was originally published by The Citadel Newsroom on November 6, 2014. 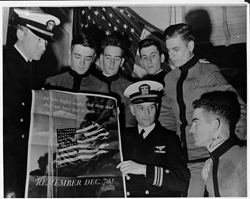 CHARLESTON, SC – In honor of the 70th Anniversary of The Citadel’s Class of 1944, known as “The Class that Never Was”, and in memory of the members of the classmates who served in or were killed in action in World War II, the college released a special video presentation in 2014 just before D-Day. Now, that video, which includes rare film footage from campus in the 1940s, is being shown in four languages throughout Europe, thanks to the work of Roger Long who is a member of The Citadel Class of 1989, and members of The Citadel Memorial Europe Foundation. Long is president of the BENELUX Citadel Club, and founder and chairman of The Citadel Memorial Europe Foundation. He lives in Heythuysen, in the Dutch province of Limburg. 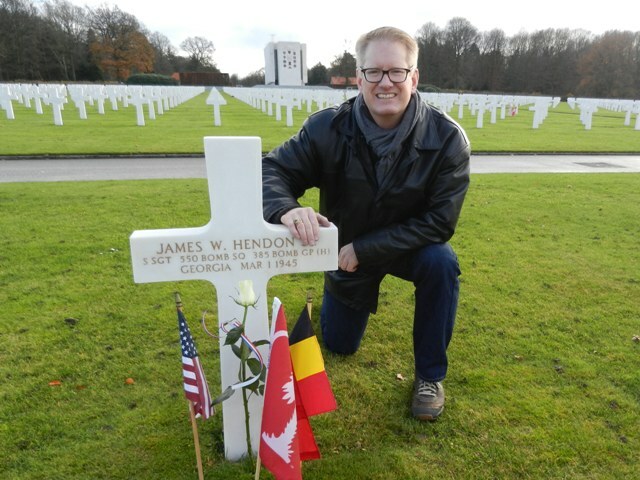 He is originally from Raleigh, N.C.
“Members of The Citadel Memorial Europe Foundation volunteer in middle schools around the continent. The video about The Class that Never Was is the perfect teaching tool we needed to help honors and memorialize the Citadel men and their allies who died while in the service of their country here in Europe and in North Africa,” Long said. Long worked with translators to establish subtitled copies of the video in Dutch, French and Italian, to complement the original version in English, enabling Europeans speaking those languages to view the video. The story is told through the eyes of Timothy Street, a WWII veteran and a member of The Citadel’s Class of 1944, as well as a lifelong resident of Charleston, S.C., where the college has been located since its founding in 1842. Street and many of his classmates did return to The Citadel to finish their degrees after serving in the war. More than 6,000 men from The Citadel served during World War II. At least 209 were killed in action or died of wounds. As for the D-Day invasion in France on June 6, 1944, 13 men from The Citadel died on that day or in the months immediately following; at least three of them were members of The Class that Never Was. Graduates of The Citadel have served America in every war since the Mexican War of 1846. Learn about the Class of 1944 by watching the video in English here. To watch the video with Dutch / Nederlands subtitles click here. To watch the video with French / Française subtitles click here. To watch the video with Italian / Italiana subtitles click here. WHAT IS THE CITADEL MEMORIAL EUROPE ABOUT? According to Long, there are 47 soldiers from The Citadel interred in and another 9 memorialized at military cemeteries in Europe and North Africa. The remains of more than 60 other Citadel alumni who were killed in action were repatriated back to the US for burial following the end of hostilities. That’s why he started the organization. “The Citadel Memorial Europe is the result of my wanting to share the stories of the Citadel Men interred in the WWI and WWII American cemeteries of Europe and North Africa with the people in France, Belgium, Italy and Netherlands who have been caring for their graves, in some cases more than twenty-five years. People who attend The Citadel are special. There is a bond between us that runs across the generations,” Long explained. “Although we may have never met each other – we know each other. The experience, values and character which makes them Citadel Men is unique and at the heart of their story. For seven consecutive years, The Citadel has been recognized by U.S. News & World Report as the top public college in the south for institutions granting up to a master’s degree. The Citadel’s mission is to achieve excellence in the education and development of principled leaders through the core values of honor, duty, and respect. This entry was posted on November 7, 2017 by Roger Long. It was filed under Ardennes, Class of 1944, The Citadel, Uncategorized, WWII and was tagged with 70th anniversary of D-Day, ABMC, Charleston SC, Citadel Men, Class of 1944, History, South Carolina Corps of Cadets, The Citadel, The Class That Never Was, WWII.